This coin, the second commemorative silver dollar struck in Canada, was minted to celebrate the visit of King George VI and Queen Elizabeth in 1939. 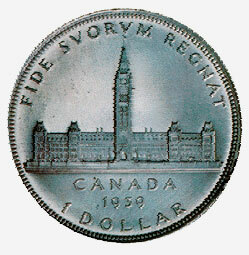 The reverse of the coin depicts the Parliament buildings in Ottawa. The Latin legend FIDE SUORUM REGNAT (He reigns by the faith of his people) appears above. The design was created by sculptor Emmanuel Hahn, whose initials, EH, appeared on the original model. This was not an unusual feature since Hahn's initials appear on silver dollars minted prior to 1939. His initial H, can also be seen on his well-known designs for Canada's ten-cent and twenty-five cent pieces - the Bluenose and the caribou head - for the series minted since 1937. The Government of the day, however, seemed to disapprove of the personal touch on this coin and the initials were removed from the final version without consultation. Hahn made strong representations to the Mint, the Minister of Finance and the Prime Minister. The only explanation that he received came from W. C. Clark, Deputy Minister of Finance, who informed Hahn that the decision to omit his initials had been made by the Governor in Council. The obverse of the coin bears the portrait of George VI facing left, surrounded by his Latin titles. The coin shown contains 80% silver and is part of the National Currency Collection, Bank of Canada.